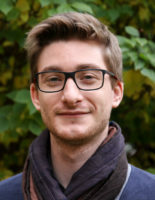 Olivier Defaux does research on history of ancient geography. His main interests are the representation of maritime spaces in Greek and Roman geography, and ancient cartography. He was doctoral fellow at the Excellence Cluster Topoi, where he worked on the Geography of Ptolemy, in particular the genesis of his catalogue of places and coordinates for the western Mediterranean area (Spain, South of France and Northern Africa). In July 2016 he obtained his PhD in History of Ancient Sciences at the Humboldt-Universität zu Berlin. From February to July 2016 he was postdoctoral fellow in research group (D-1) Space of Nature. His main research topic was the textual history of Ptolemy’s Geography. Afterwards he started a research scholarship at the Max-Planck-Institut für Wissenschaftsgeschichte in Berlin with a research project on the textual history of scientific works of Antiquity, especially dealing with mathematical geography.